Sorry if these are dumb questions. When I go to Dashboard - Appearance - Theme -- I don't even see Thematic listed, or any Theme Frameworks, for that matter. I've downloaded thematic to my computer. I just need specific instructions on how to install it. Hi mark, make sure the file is in a .zip format. Then simply go to Appearance > Themes > Install Themes (tab in upper left) > Upload (second option under the two main tabs). Then just upload thematic.zip and then activate it. Remember that Thematic is NOT a theme you should use as is, since your changes will be overwritten when an update for Thematic is released via the wp repo. Therefore, you should install a child theme, such as the "thematicsamplechildtheme" bundled with thematic, and make any customizations to it or another child theme. You can just upload the child theme the same you you would a regular theme and then activate it. 1. I chose Thematic because it seemed simple and good for beginners. But this whole child theme deal seems to complicate it. Is Thematic, in fact, a good one for raw beginners to Wordpress? And is this whole child theme deal typically found on these theme frameworks? 2. Is there a simpler, more user-friendly theme framework you'd recommend? 3. I do not see the Install Themes tab in upper left to which you refer. Where is it? I'm only seeing the Appearance and Themes tabs. 2. To be honest, most theme frameworks (if you want to call them that, since many of them are really just advanced parent themes) require some knowledge of css and php, with the exception of perhaps Genesis because it has a bunch of ready-to-go child themes already made (Genesis costs a lot of money though). I think there are some other frameworks that allow you to edit/change stuff from extensive option panels, but I can't name any off the top of my head. 1. Child themes might seem complicated if you are first starting, but they are the only recommended way of making changes to your parent them (e.g. Thematic). This is because the child theme preserves changes when the parent theme gets updated (as opposed to losing the changes you make to the parent theme when it gets updated). The parent theme is essentially the building block for your child theme. Child themes are not only seen with "frameworks" such as Thematic, but should be used with any parent theme, such as Twenty Eleven or Twenty Ten. So in short, you are indeed looking to use a child theme regardless of what parent theme or "framework" you might choose. Unfortunately Thematic has not been updated in some time, so it hasn't drawn too many developers. Hopefully some renewed activity can change that though. I hope to help people out by creating a bunch of brand new child themes with options panels soon, but in the mean time there are some existing, albeit outdated and unsupported, child themes http://themeshaper.com/category/thematic-child-themes/ out there. I'd personally recommend thematic if you want to learn more about how themes work and get your hands dirty. Otherwise I'd look at something like Genesis for ready-to-go themes. @mark, i don't want to sound rude, but if you are having a hard time installing a theme, i think you might struggle with developing a child theme. child theming does add an extra layer of obfuscation to the process of developing a theme... and most tutorials do not take this into account... they'll say "paste this into your header.php" which isn't something you'd do w/ thematic. if you do not intend to become a web developer yourself, save yourself an enormous amount of hassle and buy a premium theme (or a free one if you like the looks of it) or hire a developer. if you are interested in learning a ton about wordpress, then thematic is a great teacher. Thanks, Jagster and Helga. I feel I'm slowly zeroing in on making this happen, but I still have questions. I appreciate your patience. 2. I was looking for a Theme Framework, such as Thematic, because in my Build Your Own WordPress Site guide, it says: "You are also typically better off choosing a Theme framework over a regular theme. A theme framework allows you to customize options such as the presence or absence of sidebars directly through the theme options page." But if, as you suggest, it's too advanced for my limited skills, I'd really prefer the easiest possible way to get started. 3. This "Genesis" you recommend for ready-to-go-themes -- would that be the easiest way to go for me? I don't see it listed on the Manage Themes listing of the link I pasted above. 4. Helga -- yes, I have no desire to struggle with developing a child theme. And I don't intend to become a web developer or learning a ton about WordPress. I just want the simplest possible theme that's easy to install, learn, and use regularly. That being the case, do you agree with Jagster about his Genesis recommendation. Otherwise, I'm open to any (preferably free) themes that are easy to use. "You are also typically better off choosing a Theme framework over a regular theme. A theme framework allows you to customize options such as the presence or absence of sidebars directly through the theme options page." i don't think that means framework in the sense that i normally use framework. that really just sounds like it means a theme with an options panel. since you aren't trying to build something yourself, there's no need to limit yourself to theme frameworks. besides, technically any theme could be considered a parent theme or framework. i can't recommend a suitable theme without knowing what you are trying to do with your site. from the administrative side of things, well... wordpress is wordpress. some themes will add more features on the backend, but the look and feel and how you make posts will always be the same. however, since you've revealed your admin link (which we couldn't log into anyway) i'd like to point out the you are using wordpress.COM to host your blog and not the wordpress.ORG software to host your site on your own domain. 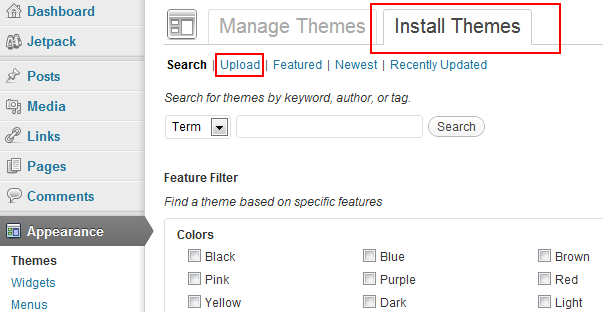 at wordpress.com you cannot install any new themes. you are limited to the ones they allow. if you want to use any other options you'll need to set up wordpress on your own hosting. Thanks, Helga and Jagster, for clearing that up. Didn't realize there was both a wordpress.com and a wordpress.org and they did different things. I'll proceed with that new knowledge now and try to install one of the simple themes found there. Much appreciated!